spillyjane knits: Wanna buy some mittens? Yes, it's late in the season, but it's still cold where I live! Maybe it's still cold (or at least cool) where you are too? Maybe you'd just like to get your hands on something ready-to-wear? Maybe you'd just like to take these home? 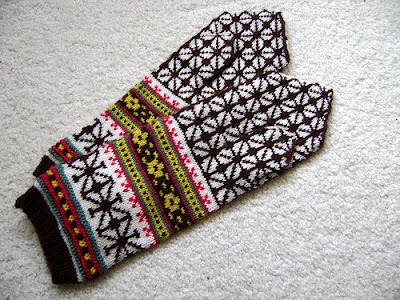 Yes, the Folky Latvian Mittens are up for sale in my Etsy shop. 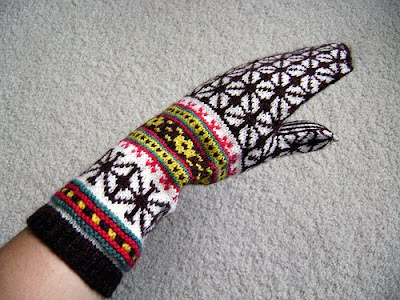 Instant Latvian mittens? Always a good thing! February 16, 2009 at 2:50 a.m. Totally loving these -- they arrived today, Thank you!! August 25, 2009 at 4:06 p.m.
Laura -- Thank you! I'm happy to hear that you're enjoying them! August 25, 2009 at 4:25 p.m.